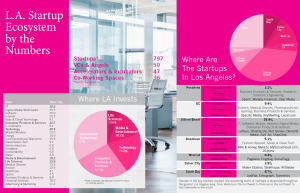 Be Great Partners, a Los Angeles technology incubator, has recently released a report on the startup community in LA and the information shows a positive growth for startups here in LA. 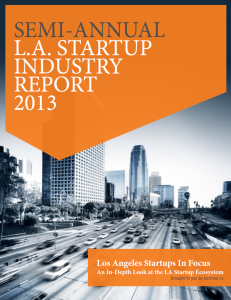 Los Angeles is 3rd in the global startup ecosystem, behind Tel Aviv and Silicon Valley. 94 new startups have launched since January 2013 to June 2013 and the startup ecosystem has raised $500 million in funding in 2013 so far. The numbers are promising and even with some problems arising in LA’s startup community, LA has found ways to keep pushing through. Los Angeles has a diverse area of startups. Be Great recognizes seven main startup points in Los Angeles: “Silicon Beach”, West LA, Culver City, Pasadena, Orange County, South Bay, and Downtown LA. The wide range of startups is great and creates more opportunities for new talent and entrepreneurs to join the Los Angeles area. The area between Santa Monica and Playa Vista, otherwise known as Silicon Beach, houses more than 35% of startups in Los Angeles. With Yahoo!, Google, Hulu, Riot Games, Demand Media, and many other big name players residing in Silicon Beach, it is no small wonder why many tech startups flock towards the sunny beach-side view. Orange County is home to a large number of biotech and medical devices sectors. Pasadena another growing startup community, has startups focusing mainly on business products and services and sciences. Downtown LA is known for their fashion and apparel and clean tech sectors. Each city has a different focus, but the combined amount of startups has definitely drawn some investors’s eyes toward Los Angeles. However, the lack of a centralized startup hub in Los Angeles creates a problem. Unlike Los Angeles, other global startup communities have a centralized area for startups. A centralized startup community provides a stronger and talented group of individuals, entrepreneurs, and investors to communicate and build a healthier startup community. Los Angeles does not have that centralized feel, which creates solitude amongst startups in different cities. Startups in Pasadena are going to have a harder time to meet other individuals in Orange County. The South Bay investors will have a harder time running into other innovators in West LA. A healthy startup community needs to communicate and create new ideas together. Communication and growth will bring more capital and investors to start new businesses and ideas to create more opportunities, thus continuing the circle of startup life. 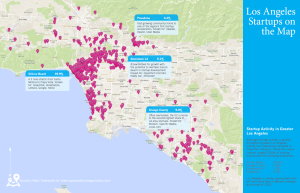 Venture capital is also affected by the fragmented locations of startups in LA. Not enough money flows in LA. Compared to Silicon Valley, LA only has only about one-tenth of VC investments. Despite the fact LA lacking VCs, Be Great reports VCs and angel firms invested an average of about $4 million, ranging from $25,000 to $30 million. Los Angeles City Council is also involved with the growth of Silicon Beach by adding tax breaks and investment incentives. Adding low rent to LA’s Council incentives has brought more startups to Downtown LA. Co-working spaces is a fairly new concept, yet it is the home base for many LA-based startups. The idea of co-working spaces is to have a small community of talented individuals and offer affordable office space and resources for those new to startups and don’t have the finances to spend on a typical office space. LA brings forth a lot of talent from USC, UCLA, and Caltech. There are many other local universities to add to that talent pool by offering startup programs to keep a lot of the talent in LA and help build on the startup ecosystem. Be Great identifies LA’s startup ecosystem slowing down in 2013 compared to a few years back, but there is a lot of potential left in the city.